Today we’re here to share with you a new and exciting product – the Barista Brain coffee maker. 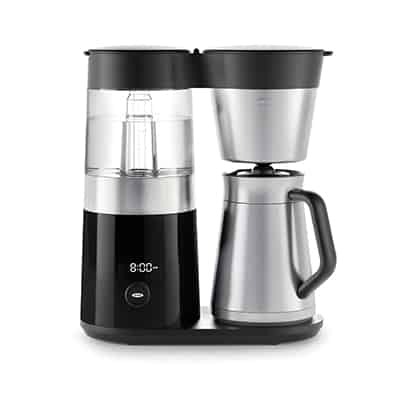 We have tested hundreds of drip style coffee makers to find the best of the bunch and the OXO Barista Brain impressed us so much that we voted it as our choice for the best overall coffee maker. That’s a pretty good indication of the standard of this machine but we would still like to share some details about the machine and our experiences of using it so that you can decide for yourself if the Barista Brain is the right machine for you. Why Choose the Barista Brain Over Other Models? Who is the Barista Brain Perfect for? Microprocessor controlled brew system: This means the machine is powered by a computing system. It replicates the pour over method for fuller extraction. Can make two to nine cups in one pot. Heater: The water is heated and held at the perfect temperature for coffee, so you are guaranteed a nice hot cup to drink, but it won’t be hot enough to impair the flavor of the coffee. Rainmaker shower head: This great feature means that the water isn’t funnelled into the machine in a single stream. Instead, it is evenly sprinkled across the surface of your coffee grounds to ensure the extraction is even and the full flavor is extracted. LED interface: The LED screen displays a clock and the status of your coffee. This includes a freshness countdown so you can be sure you’ll never risk drinking your coffee when it’s not at its best. It can also be set to any time in a twenty four hour period so it comes on and brews your coffee for exactly when you want it. OXO On Conical Burr Coffee Grinder: If you don’t already have a coffee grinder, or you are thinking of purchasing a new one, OXO On make their own version which is perfectly compatible with the Barista Brain. This machine is super easy to use. Add your freshly ground coffee and fill up the water tank. Then simply select how many cups you want to make and the machine does the rest. The microprocessor carefully monitors the water’s temperature, the volume of water and coffee and the time taken to extract the flavor. This ensure that you get a consistent brew each time. The coffee is really easy to pour once it’s brewed. Simply open the little door and pour. The door reseals when the pot is resting. The coffee this machine makes tastes really good and produces a nice, strong flavor. This machine has even been certified by SCAA (Speciality Coffee Association of America) which is the hallmark of a good coffee maker. It’s also worth noting that the product isn’t compatible with transformers and if it’s used outside of the US, the warranty will be void. As with anything, even the best products sometimes have features which some users won’t like. The main downside to this coffee maker is that the brewing process is so tight that your home won’t get that gorgeous freshly brewed coffee smell. While to some people this will be an advantage because it proves how tightly sealed the carafe is, for some, it ruins the experience of freshly brewed coffee a little bit. It’s also a little expensive running around the $200 mark. Anyone who wants to be able to pretty much forget they have it – pre-set it and then ignore it! Now you can probably see why we chose the OXO Barista Brain as our top pick for the best overall coffee maker. With delicious coffee, a simple process and coffee that keeps hot a long time, the Barista Brain is the next generation of coffee maker that will delight you every time. With delicious coffee, a simple process and coffee that keeps hot a long time, the Barista Brain is the next generation of coffee maker that will delight you every time. Does the oxo on come in a size that can make more than 9 cups? This machine is ideal for 9 cups. If you need more than 9 cups, there is an Oxo 12 cup coffee maker but the reviews are not so good. So I advise you to stick with the 9 cup model.